Breast cancer metastasis slowed by targeting cells that regulate blood flow. Tumours require blood to emerge and spread. That is why scientists at The University of Texas MD Anderson Cancer Center believe that targeting blood vessel cells known as pericytes may offer a potential new therapeutic approach when combined with vascular growth factors responsible for cell death. A study from MD Anderson, Beth Israel Medical Center, Harvard Medical School, and the École Polytechnique Fédérale de Lausanne looked at how cellular signaling by vascular growth factors called angiopoietin-2 (ANG2), when combined with depletion of pericytes, may decrease breast cancer tumour growth that spreads to the lungs. Targeting pericytes and ANG2 signaling may also offer new potential therapy options for treatment of some breast cancers. The opensource study is published in the journal Cell Reports. The current study showed that angipoietin signaling is a key metastasis promoting pathway associated with abnormal tumour blood vessels with poor pericytes coverage. When combined with pericyte loss during the late phases of tumour progression, it is possible to reduce both primary tumour growth and metastatic disease. Previous strategies to target how tumours develop blood supplies have looked at pericyte depletion. Pericytes, cells that wrap around capillary cells throughout the body, have the ability to contract, thus regulating blood flow. Since angiopoietins are blood vessel growth factors that provide the green light for new arteries or veins to grow, the combination of the two is of interest to cancer researchers. The team state that targeting of ANG2 signaling in tumours with abnormal blood vessels with low pericyte coverage appeared to restore vascular stability and decreased tumour growth and metastasis in lung cancer mouse models. The team also found that ANG2 was tied to poor outcome in patients with breast cancer. These results emphasize the potential for therapies targeting in advanced tumours with poor quality blood vessels. Strategies to target angiogenesis include inhibition of the vessel-stabilizing properties of vascular pericytes. Pericyte depletion in early-stage non-hypoxic tumors suppressed nascent angiogenesis, tumor growth, and lung metastasis. In contrast, pericyte depletion in advanced-stage hypoxic tumors with pre-established vasculature resulted in enhanced intra-tumoral hypoxia, decreased tumor growth, and increased lung metastasis. Furthermore, depletion of pericytes in post-natal retinal blood vessels resulted in abnormal and leaky vasculature. Tumor transcriptome profiling and biological validation revealed that angiopoietin signaling is a key regulatory pathway associated with pericyte targeting. Indeed, pericyte targeting in established mouse tumors increased angiopoietin-2 (ANG2/Angpt2) expression. Depletion of pericytes, coupled with targeting of ANG2 signaling, restored vascular stability in multiple model systems and decreased tumor growth and metastasis. Importantly, ANGPT2 expression correlated with poor outcome in patients with breast cancer. These results emphasize the potential utility of therapeutic regimens that target pericytes and ANG2 signaling in metastatic breast cancer. 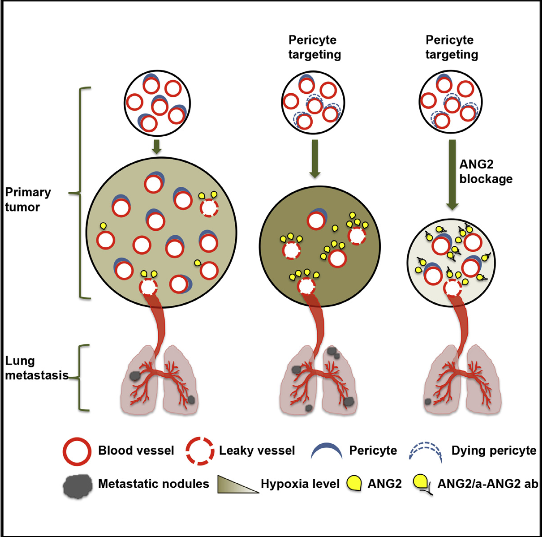 Targeting Vascular Pericytes in Hypoxic Tumors Increases Lung Metastasis via Angiopoietin-2. LeBleu et al 2015.